nyone who knows me, knows that I love animals, especially rabbits and hares. 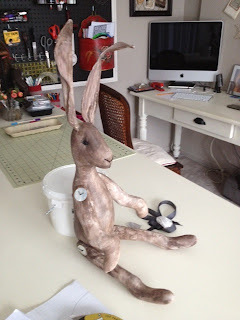 There is rabbit toile wallpaper in my powder room, which gives me insane license to put my papier mache ones in there. I really didn't need any excuse to make up a pattern and sew this one, along with a few friends. 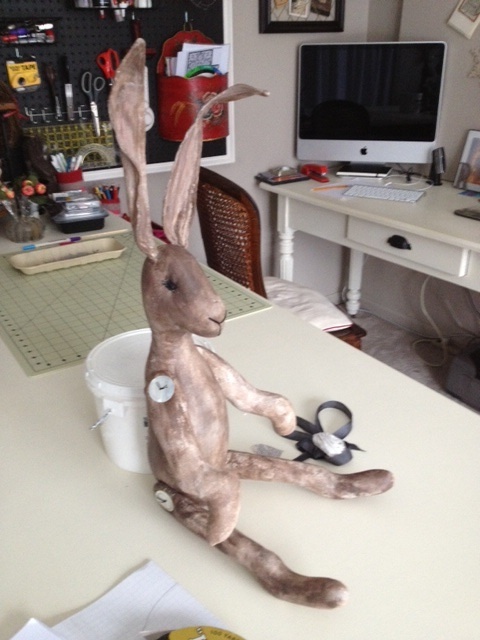 Le maigre liévre (the skinny hare) is not finished yet, but I am in love with his imperfect little self. No realism here, just all personality. Outrageously large ears and legs, very large MOP button joints. Since I was in a pattern making mood, I thought I'd create a deer head as well...still working out the antlers material. Clearly, I needed the break from all the knitting and crocheting I have been doing. I will post my progress as I go...I have had a request for a wolf, we'll see! Thank you so much Dawn...can't wait to finish the others, so much fun to see them come to life!